The Wheeling Farm Store on the south side of Dundee Road just east of the river was built by Charles F. Balling. 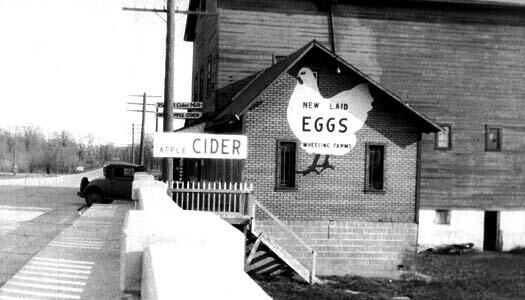 He sold vegetables, cider, eggs, and dressed poultry to people from the Wheeling area and the North Shore suburbs. He goes on to explain that he built quite a building, and he had a dam put in south of the brewery. In winter they’d hire a crew to cut ice and fill his ice house and those of all the taverns. “That was the only way they could cool their beer and pop and stuff. So he began his operation by buying produce and when people discovered it, they wanted to buy it fresh. The property eventually was taken over by the Forest Preserve District of Cook County, Illinois. These facts are all documented in the popular local book. Wheeling Through the Years, our own Village history book. Get out your answer sheets and see how you fared. What was the cost of a good meal at Wheeling's first tavern built by Joseph Filkins in 1837? What was housed at Palwaukee Airport in 1933-34? What was the cost of the first village hall In Wheeling (now located in Chamber Park, 251 N. Wolf Road)? What was the former use of the present Congregation Beth Am building at 850 Jenkins Court, Wheeling? What Wheeling structure was known as The Bon Air in prohibition days? What event was announced in the Wheeling Independent on Wednesday, Aug. 15,1956? What was formerly standing on the present site of the Maine Bank of Wheeling? Why was Wheeling's former Vitruvius Lodge called a "moon lodge?" 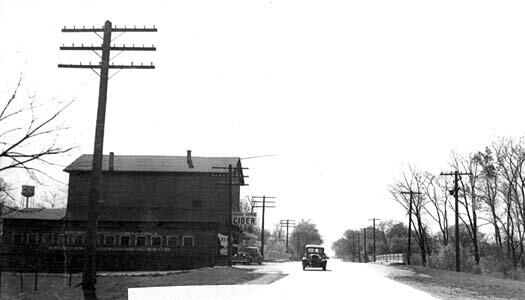 What was the very first name of Milwaukee Avenue? What did children wait to sec on summer evenings in Wheeling? What was the main problem of patients entering the former Wheeling Hospital, opened in 1927? What did Wheeling win an award for in 1962? What were two trades that failed to survive in Wheeling?